Should Doctors and Nurses Never Discuss Religion with Patients? MARGATE, England — A Christian doctor in England has been threatened with an official warning from his professional body for discussing Jesus with a patient, The (London) Sunday Times reported. Richard Scott, a doctor for 28 years, is under investigation by the General Medical Council (GMC) and faces disciplinary action after he suggested to a 24-year-old man that he might find solace in Christianity. Scott, who practices at a medical center in Margate, east of London, well known for having Christian doctors, insists he only raised his spiritual beliefs after carrying out a thorough and lengthy consultation, during which medical checks and referrals for further care were arranged. When the man’s mother inquired of the consultation, however, her son apparently replied, “He just said I need Jesus.” This prompted his mother to refer Scott to the GMC, claiming that he had not offered medical advice during the consultation but instead talked about Jesus. The young man, who has been described as “in a rut and in need of help” grew up in a different religion but his faith had lapsed. He has continued to seek treatment from the practice despite the complaint filed by his mother. The GMC has written to Scott suggesting he accept an official warning but the GP (family doctor), who has an unblemished record as a medic, has decided to fight the allegations and stand up to what he believes is a politically correct trend in Britain to persecute Christians for expressing their faith in the workplace. So, a doctor mentions Jesus to an adult, and his mommy turns the doctor in, and the medical board wants to discipline the doctor? If the patient had been 5, I think a complaint could be warranted. But an adult? Jeez, the UK has sure become anti Christian. Remember the nurse suspended for offering to pray for a patient? But I don’t want to get into that. My question is: Should doctors and nurses be forbidden to discuss religion at all with their patients? My physician and I talk about things other than my health when he’s putting on the rubber gloves. He once gave me a New Age DVD to watch. I am not of that persuasion, but I didn’t object. I was touched that he cared enough about me to share something that is clearly important to him. Should I have reported him to the medical board? Good grief. Sure, there is a line that should not be crossed in this regard, but don’t we want our interactions with physicians to be personal? I mean, are we going to make doctors and nurses censor themselves to the point of utter banality or the solely medical? If the answer is yes, because religion is “divisive,” then should doctors and nurses be threatened with losing their license for discussing politics with their patients? That’s divisive. How about sports? 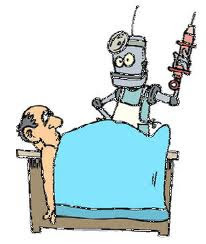 Medicine is becoming a technocracy. Part of that, I fear, is coming from the medical profession (still) itself. But part of it is also coming from a segment of society that is increasingly hypersensitive and intolerant of being “offended.” Grow some skin, folks. Let our medical professionals be human beings, not medical robots.